While it's been a long cold winter, there is a feeling of optimism in the air as spring approaches. Spring is traditionally the major selling season of the year when the volume of new listings rises sharply. There are mixed feelings out there in the property market. Some buyers are taking their time, researching and watching the market cautiously or just sitting on their hands. Some vendors are holding off listing or withdrawing their property from sale until the market activity increases. Overall there is a subdued sentiment coupled with a lack of urgency. But the spring season typically brings a renewed optimism as vendors prepare their properties for sale and buyers begin their search hopeful to find that perfect property. We have found that most buyers take between 6 to 12 months or more to find the ideal property researching on their own. As professional buyers' agents we find a suitable property within 30 to 50 days. Some of the leading market indicators are starting to show small signs of life in the property market. Auction clearance rates in Sydney have been averaging around 60% the last month (compared with 54% a year ago and 50% in December, from Australian Property Monitors). Melbourne's auction clearance rate was 58% last weekend. Another lead indicator, the value of finance approvals for owner occupiers, also increased 1.2% in June. The volume of stock is still quite limited in the lower and middle segments of the market. Units in the $450,000 to $800,000 bracket and houses in the $750,000 to $1.2m range are in the highest demand in Sydney. The "affordable" end of the market is likely to be more contested this spring. Recent data from independent analyst RP Data-Rismark shows Sydney dwelling prices increased 1.2% in July. It was the second monthly rise in a row and also backed up by the latest Australian Bureau of Statistics June quarter figures showing growth. It's very hard to precisely pick the bottom of the market, but the conditions are ripe for good value buying. 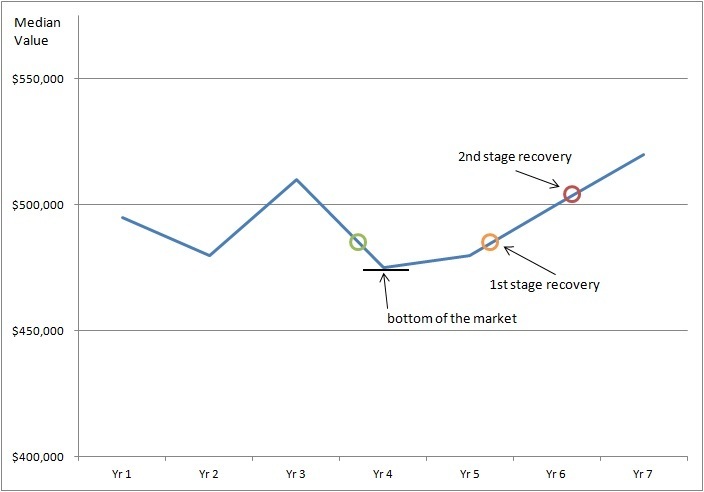 As the chart below demonstrates (example only) we have observed that buyers prefer to purchase in the second stages of an upswing rather than at the bottom. In economics this is called "loss aversion" - where people strongly prefer avoiding losses to acquiring gains. Some economic studies suggest that losses are twice as powerful, psychologically, as gains! It all comes down to your appetite for risk. Yet property has proven time and again to have one of the highest gains and lowest volatility over the long term. Buy at the bottom or on the recovery stage? 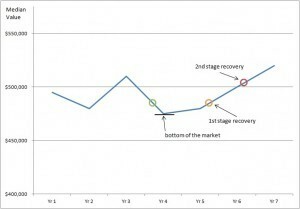 Example chart only and does not represent a particular area. Some of the key factors that will influence buyer and vendor sentiment in the coming months will be the direction and stability of interest rates, whether Europe continues to sap consumer confidence, job creation and economic growth in the Australian economy. So how can you capitalise on the market sentiment this spring? If you buy and sell in the same market there is likely to be less change over cost. It's a great time to upgrade for home buyers. Create your own destiny - waiting for the market to boom or decrease could mean putting your dreams on hold for quite some time. Don't try to pick the bottom - buy when you can afford to move forward and research extensively. It takes some time for the market to really build momentum. Consider what is holding you back....time, money, knowledge, expertise, confidence? Speak to experts that can help guide your decision making and get a professional buyers' agent on your side. Take a long term approach to investing and home buying. How would you like to buy a brand new investment property with two sources of income! In a market with subdued capital growth prospects, it makes sense to include a selection of positive cash flow properties in your portfolio. Positive cash flow properties put money in your pocket every week and provide a reliable source of income not tied to the sharemarket. The bonus with both of these properties is you get two sources of rent and depreciation which will maximise your cash flow.